If you’ve been around me long you will learn that I write painfully slow. I don’t use a computer at all, instead I write everything down in what Lisa calls “block printing” on my yellow legal pad. I scratch things out, rearrange with arrows, and my spelling is horrible. Then I give it to Lisa and she goes through it and types it up so it will make sense. We have done it this way ever since she married me and brought one of those confounded computers with her. Now, don’t get me wrong, I can run a fax machine and am learning to text (slowly) on my cell phone so I’m not a complete technology misfit! But as slow as I write, letters are rare. I prefer the postcard. It has a pretty picture of where I am, a nice small box where I can print about 3 sentences if I’m lucky and then I address it, slap a stamp on it and away it goes! So (with Lisa’s help) I figured I will try this on here and occasionally send you an electronic “postcard” when I don’t have time to write something longer but want to say “hi”. 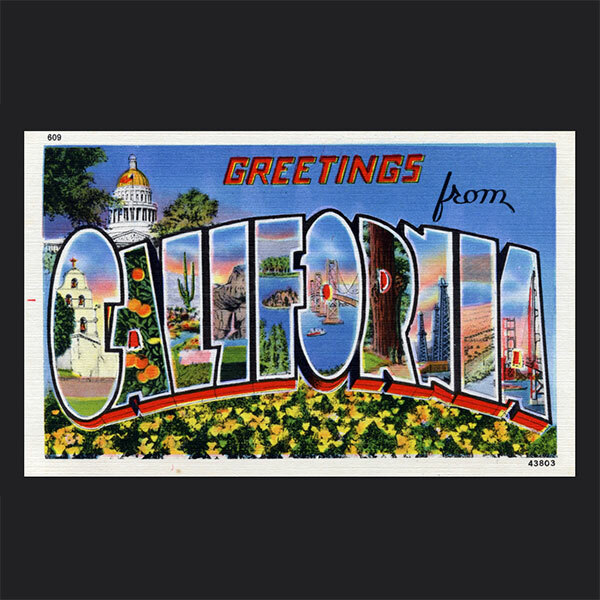 This first one is from here in California where I’ve been working in the studio between gigs on my newest songs, Hell in a Helmet and Not For Sale. Greetings! From sunny Southern Ca, where folks here dress like they drive: WIDE OPEN! I had a great day in the studio and am working with some tremendously talented players including the most sought after drummer in history! He even played on “Jackos” Thriller album. Can’t wait for you to hear the new songs!